If that wasn't bad enough, it appears her brother would love to see her dead. Luckily, Yelena has some old friends to help her with all her new enemies.. Source: Info in the About Magic Study was taken from GoodReads at http://www.goodreads.com/book/show/46202.Magic_Study on 15/04/2011. 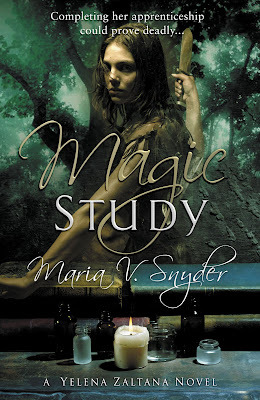 This being book 2, the character development and world building was done already in book 1, Poison Study, and continued with the same masterful flair in Magic Study. I also love the author's "voice" but I do not like the way the protagonist constantly act stupid in the author's blatant effort to give the story more drama. Good read none the less. Great follow-up to Poison Study. My review of Poison Study is here. I liked Poison Study a lot, but for some reason I haven't gotten around to buying the sequels. I saw them yesterday in the adult romance section, and it struck me as odd since they are labeled as Young Adult. The first print editions were marketed in the regular fantasy genre. And that has always been an "adult" arena. However, a few years back when the YA genre exploded, they re-packaged the trilogy and remarketed it as YA. There is a romantic subplot, but the main plot line is fantasy. I think they are just trying to widen the target readers for these books. I've heard a lot of good things about this series, but have never read it for some reason! Glad you're enjoying, I'm a fantasy fan so I think I'd like it. Thanks for the review! I love this series! I will say that poison study was by far my favorite and I wasn't very imposed with fire study...there was no actual fire study! I haven't bought the glass trilogy yet (the follow up trilogy to this one) because of my disappointment in this series end...I'm also waiting for the covers I want lol.